No matter how many times I bring up escape rooms, I keep hearing the same thing. “You know what would be really cool? If they have a “Saw” Escape Room based on the movie and you have to escape Jigsaw’s traps!” Well, friends, it looks like your prayers have been answered. 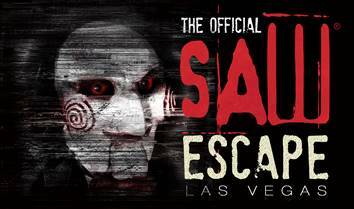 Opening in late January 2018 in Las Vegas just a few minutes away from the strip will be a “Saw” Movie Escape Room. ‘The Official SAW Escape Experience’ will feature numerous themed rooms where guests will go toe-to-toe with the notorious Jigsaw. After entering what appears to be an old, abandoned meat-packing plant, guests will be plunged into a world of traps and puzzles where they will need to work together to escape not just a single room, but the twists and turns of an entire building. The iconic SAW bathroom scene will be just one of the many highlights along the way, as visitors are put to the test in what has been designed to be an entirely immersive experience and one of the largest escape attractions in the world. Would you try a “Saw” Movie Escape Room? Too intense? Not intense enough? I am really excited to see how this turns out! This entry was posted in Outside The Parks and tagged Circus Circus, Frightdome, Jason Egan, Las Vegas, Saw Movie Escape Room. Bookmark the permalink. Trackbacks are closed, but you can post a comment.